Well, we finally did it – our new Music for Classroom Management CD is finally here, and it’s posted on the website! I am so excited, because the kids and I are LOVING this CD! And, as fate would have it, I wound up with a very difficult class this year, so having songs to review the rules has really been helpful. God works in mysterious ways, doesn’t He? I have encountered one classroom management problem after another, and have tried to solve them musically. 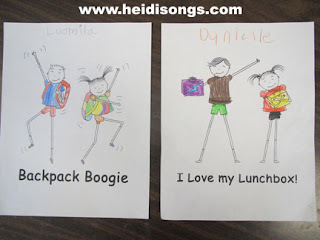 The list of songs kept on growing and growing throughout the year, as I plowed my way through different situations and tried to solve them by writing songs and teaching the children to sing them. Now I am going to tell you about a few of them! We also are working on some visual aids to go with this CD, and we are providing you with some free downloads from it for your kids to color, just for fun! Nobody Likes a Tattle Tale! Is there any good solution for solving the never ending problem of tattling? Well, my friend Tammi that I teach with told me once that when her children tattle for non-emergency reasons, she would sing out, “Nobody likes a ….” and the kids would fill in the end of the sentence with the word “tattle tale!” So I developed that idea into a full song, and I am finding it EXTREMELY effective! The children absolutely LOVE to sing it, and they actually seem to sometimes use that song as a weapon, I’m afraid! As soon as somebody announces, “I’m telling!” a child will begin the chant, “Nobody likes a tattletale, Nobody likes a tattle tale! If you tattle every day, nobody’s going to want to play!” That usually stops the tattler in his or her tracks! Once a child made it all the way across the room during playtime while this chant when on, and then stood in front of me, ready to tell his story. And then he stopped. And I waited… and waited…. And then I asked him if he had something to tell me. He said, “No, I guess not,” and walked away. Problem solved! Gotta love it! Nobody’s going to want to play! But if it’s not, be a friend! Zip it up and that’s the end! I have to say that I, personally, would buy the CD for this song alone. It’s that effective. Because the limbs are narrow, the kids enjoyed using colored pencils more than crayons. Is It a Question or a Story? Enter, stage left: my class this year, filled with very talkative children that love to tell stories and tall tales, such as, “My little sister got eaten by an alligator.” So, as I was getting ready one morning, it hit me: why not make up a song to help kids decide if what they want to say is a question or a story? (These crazy ideas for songs and activities always seem to pop into my head during the most menial, repetitive tasks of the day!) And then the song itself also popped right into my head! So after I finished getting ready, I wrote it down on a post-it note, and then later recorded a voice message to myself on my iPhone so that I wouldn’t forget the melody. That’s what I have to figure out! Before I raise my hand! A question’s what I ask to find something out! Find something out, find something out! We used Crayola Twistable pencils to color most of these! My kids responded AMAZINGLY well to this song, and it was incredibly effective! Now, after teaching the song, the children themselves do not let others just tell stories when they raise hands, unless I designated it as a good time to do that. For example, I asked the children the other day if anyone had ever been to the zoo and seen an elephant, so they raised their hands and told me about it. I Can Follow the Rules! When we follow the rules! And I follow the rules! And I follow the rules! More time for fun stuff every day! When we follow the rules at school. Here are some quick notes on the other songs, just in case you are interested! 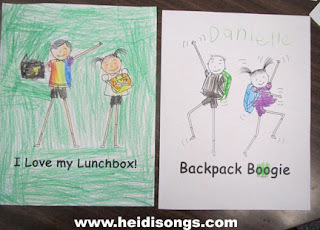 The Backpack Boogie: This song is for teaching the procedures for coming inside in the morning, putting things away, and getting settled. This has been a challenge for my group this year, since many of them would much rather socialize and wander about the classroom rather than put their things away and have a seat! Unfortunately, this song came too late in the year for it to really do me much good. I think it would have helped a lot more at the beginning of the year. I am looking forward to starting out the year with it in August. When the Bell Rings, Freeze! : My kids adore this song! 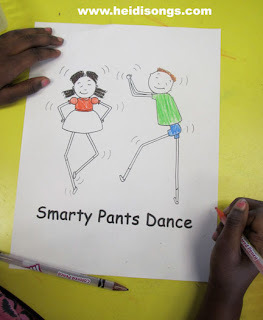 It’s fun and quick, and they LOVE to dance and then freeze when the bell rings! It’s a great way to reinforce what we do when the bell rings- FREEEEEEEZE! Stop! Hands up! Interrupting: This is one of my personal favorites! In fact, I’m thinking of writing another Wiggles book that deals exclusively with interrupting, using this song as a refrain in the book! It goes, “Interrupting is very disrupting. Don’t start squawking when someone else is talking!” And that’s the whole song! We just sing it several times through. Now when my kids interrupt in class, I often just start singing this song, and the rest of the class joins in. Outside voices inside make it hard for us to learn! Screaming’s not okay! Screaming’s not okay!… The song goes on to have the children practice using outside voices, inside voices, and whispers, so that they can hear and feel the difference. Cover Your Mouth and Blow Your Nose: These two songs are wonderful for teaching kids these basic skills for hygiene that will all NEED in order to stay healthy. I particularly like the “Blow Your Nose” song because it not only addresses why to blow, but HOW to blow your nose, (by taking a breath, closing the mouth, and blowing the air out through the nose like a dragon!) The kids like it because it is “The Dragon Song,” to them! Potty, Potty, Flush, Flush… & The Potty Dance! : At the beginning of the school year, I was trying to get the children to follow the rules in the restroom (without a lot of success, I might add!) Later on, I came up with this little song, and the kids now LOVE to sing it together during their playtime, LOL! 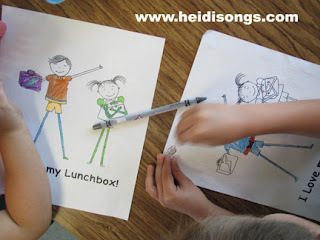 Snap That Cap: This song is for reminding children to replace the cap on a marker when they are done using it. Enough said? 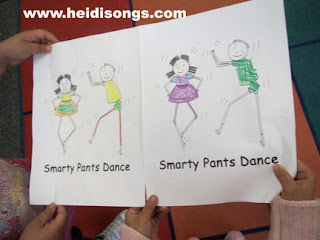 The Smarty Pants Dance: This song is a “victory dance” for when kids finally “get it!” My students simply LOVE it for the catchy beat and the opportunity to shake their little booties! Just check out how much fun we had recording it in this video clip of the “HeidiSongs Singers” in the recording studio! It was SOOOO much fun! Line Up: This song is for teaching the rules while walking in line. My kids love to chant it while we walk to lunch and the library. That doesn’t mean that they actually follow those rules while they chant it, but hey- I can keep trying, right? We Don’t Fight! : This is the same song that is on Sing and Spell Vol. 5 as the “Fight” spelling song. The lyrics were designed to be used as either a spelling song or a conflict resolution song. So this one serves a dual purpose! Use it well. And I think that the rest of the titles speak for themselves! If you would like to download the full lyrics and handmotions, please click here! We also have a Classroom Management DVD! Follow me! Did you enjoy this post? Do me a favor and share it with your friends! And follow this blog by signing up email updates, or follow on Bloglovin’, or follow me on TPT! I’m also on Pinterest, Facebook, Twitter, Google+ and YouTube, too! Don’t forget to sign up for our email newsletter (on the left sidebar) for special deals and promo codes that you won’t find out about anywhere else.